HTTP has become the underlying protocol for almost all networking applications. TCP sockets, the objects used by computer programs to build HTTP applications, have revealed their limits in terms of performance and capacity. To overcome these limitations, 6WIND has developed a high performance TCP stack outside the operating system relying on an event-based socket API to implement the TCP application. This architecture provides zero-copy operation and low latency-calls between the TCP stack and the application to significantly increase performance and capacity. 6WIND TCP Boost, based on 6WINDGate, is a module delivered in source code that allows developers to create high performance TCP applications. 6WIND’s TCP stack leverages DPDK (Data Plane Development Kit) in a fast path userspace model to eliminate Linux performance bottlenecks. 6WIND TCP Boost module can be combined with other 6WINDGate networking modules including Layer 2, IPv4 and IPv6 forwarding, firewall / NAT, Virtual Routing and Forwarding (VRF) and more to provide a complete solution. On an Intel platform, 6WIND TCP Boost delivers 12 Gbps per core of traffic with 8 million active concurrent sockets and 7.1 million transactions per second (TPS). 6WIND TCP Boost can leverage many execution environments including DPDK on x86 and Arm processors. It includes an event-driven API with BSD-like callbacks so you can easily design high performance TCP applications. This module is widely deployed as the industry’s highest performance TCP userland stack since 2010. It can be combined with hardware-based offloads supported by DPDK such as TSO, GRO, LRO and checksum from Mellanox CX or Intel ixgbe and i40e. 6WIND discovery service package to analyze the customer application and estimate the effort for completing its integration with the 6WIND TCP Boost. 6WIND customer assistance including complete training for the integration of the application with the 6WIND TCP Boost. 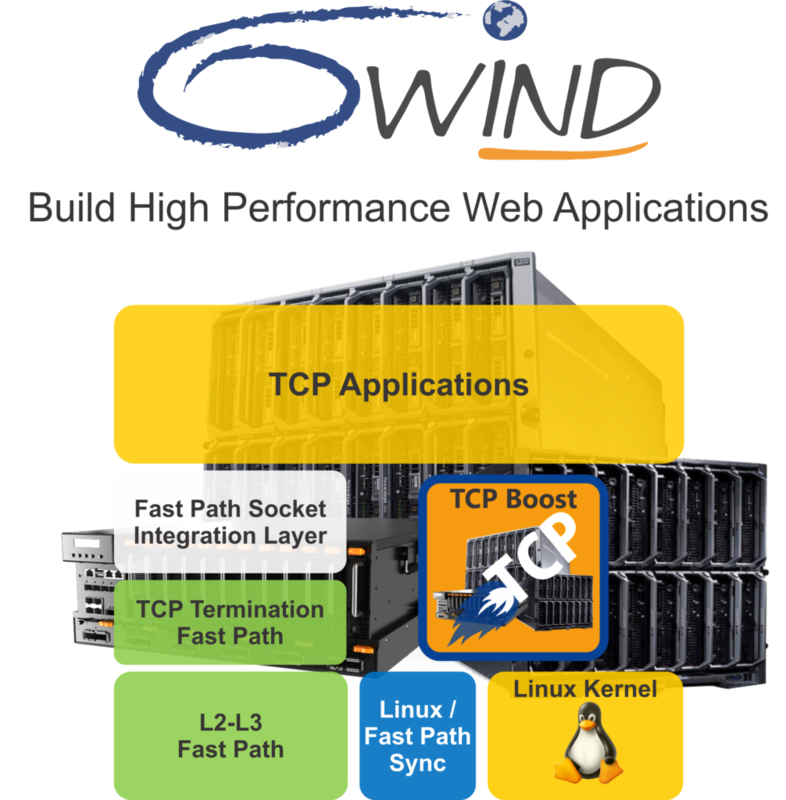 6WIND software services to integrate the application with the 6WIND TCP Boost. Cloud Service Providers Build your own HTTP networking components (server, proxy, load balancer, memcached and more) leveraging 6WIND’s TCP stack to deliver high performance HTTP traffic for a large number of concurrent sessions and significantly reduce your CAPEX and OPEX. Network Equipment Manufacturers Boost your network security product lines (load balancer, proxy, application delivery controller and more) leveraging 6WIND’s high performance TCP stack. Storage Providers Provide the industry with high performance applications (memcached…) and storage appliances (iSCSI…) leveraging 6WIND TCP technology.